Looking to buy twine or string online, then look no further. Our balls of white, yellow and black polypropylene twine or string are a great general purpose twine which are used widely in agriculture, building trade, DIY, bailing waste, hanging carcasses up in abattoirs, horticultural, farming, tying up newspapers, fishing, crafts, garden, packaging and domestic uses. We have the full range including 1400m, 700m, 450m, 350m, 280m, 170m and 130m available in 1kg, 2kg and 4kg balls or spools which are both fine and thick. 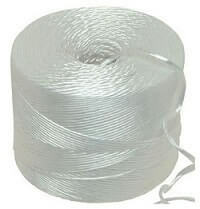 Our polypropylene tying plastic twine floats and it is very strong, light weight and has a low stretch. This twine is manufactured in the UK and each spool is shrink wrapped with plastic not like cheap imports to protect the twine and also to make it easier to work with.